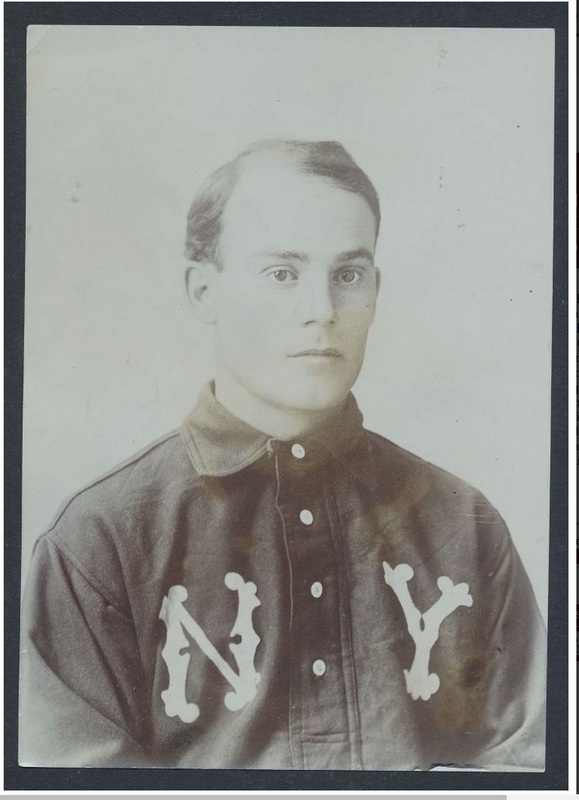 Lot #124:1903 Kid Elberfeld, New York Highlanders Portrait Photo by Carl Horner, "His T206 Pose"
Note the bottom right corner is not as ripped as the copy below. Apparently there are many prints of this photo. 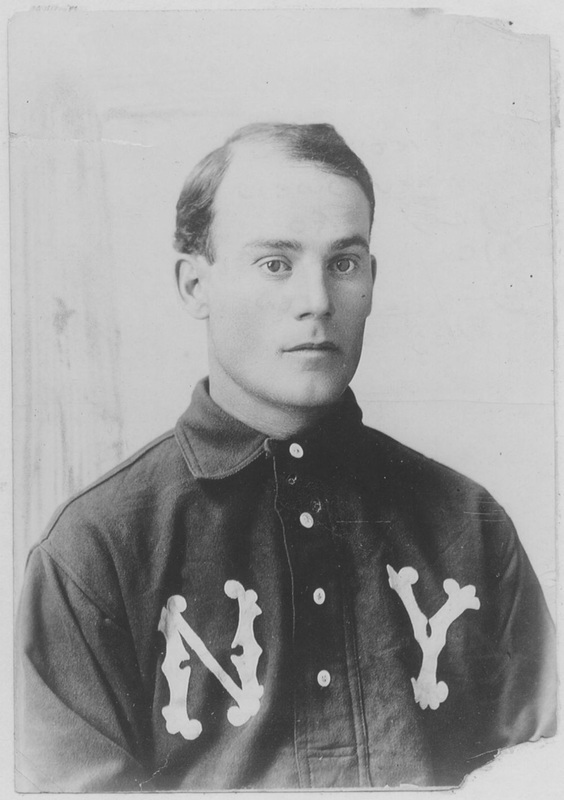 1903 Kid Elberfeld, New York Highlanders Portrait Photo by Carl Horner, "His T206 Pose"
Same face, but a different shirt on the 1909 T206 card. This is the original photograph used in numerous baseball cards. Original silver gelatin studio photograph of Kid Elberfeld from noted photographer Carl Horner. While Horner created most of his works on mat finish paper and sold them as cabinet photographs, he also sold images on gelatin paper to newspapers and magazines a bit later for publication (around 1907-08). This is one of the latter types and was issued by Horner and was never glued to a cabinet backing. Completely original, this is an iconic image of popular player Norman "Kid" Elberfeld which was used to make his popular T206 baseball card among others. Condition is fantastic and the image is a silver gelatin "Vintage 1". Baseball history is filled with colorful nicknames. From the most well known, like Babe Ruth and Shoeless Joe Jackson, to the just plain strange, like Oil Can Boyd and George Piano Legs Gore. One unique name that stands out belongs to Norman Elberfeld. Norman was best known as Kid. 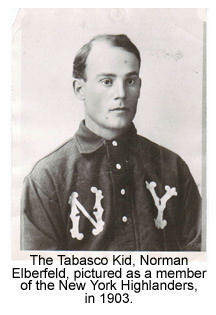 While there were countless other players known as Kid, Norman's Kid was short for The Tabasco Kid, and was so named for his hot temper. 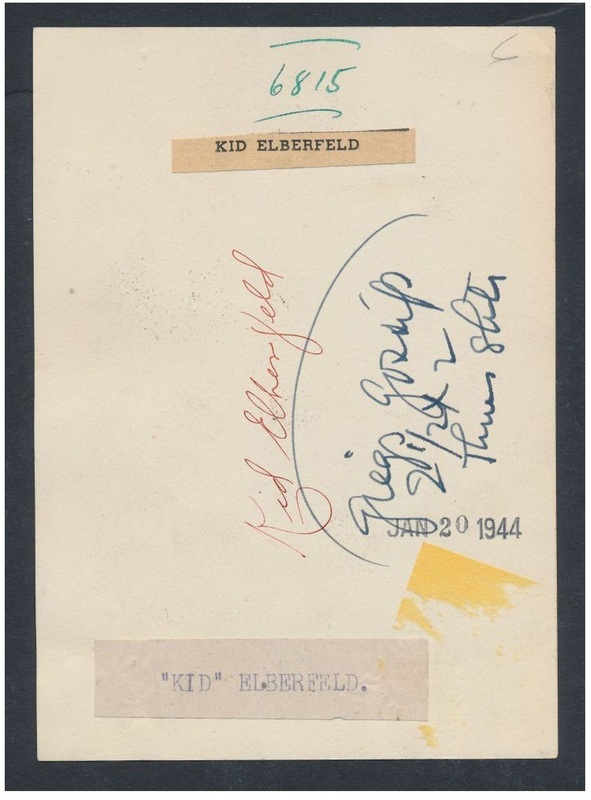 Elberfeld was apparently such a hot head that during a nose-to-nose argument with an umpire during a minor league game, he threw a lump of dirt into the screaming ump's open mouth! Depending on who you asked, Elberfeld was born in either Pomeroy, OH or Mason City, WV in 1875. Many accounts state that he was born in 1876, but his grave marker says 1875. As an adult, Kid stood 5'-5" or 5"-7" depending on the source and tipped the scales at 150lbs but his temper made up the difference. The Tabasco Kid's baseball skills were so impressive in the beginning that a scout selected him to be Philadelphia's next shortstop over another young kid, Honus Wagner. He was in Philadelphia in 1898 and in Cincinnati in 1899. 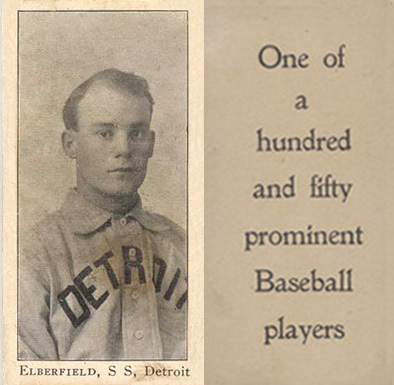 Elberfeld spent less than one season with Cincinnati before being sent to Detroit in 1900. 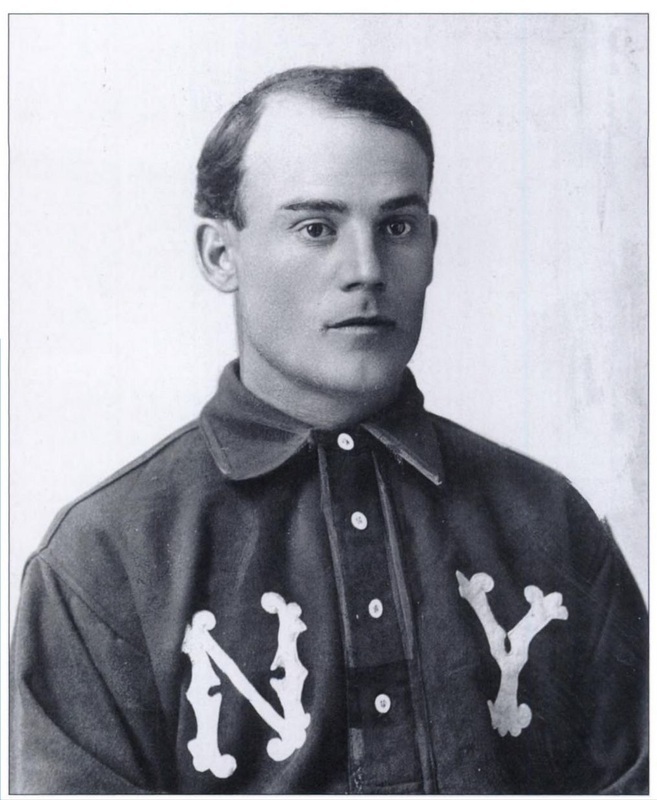 In 1903, Kid joined the New York Highlanders (later the New York Yankees) and stayed in New York until 1909. 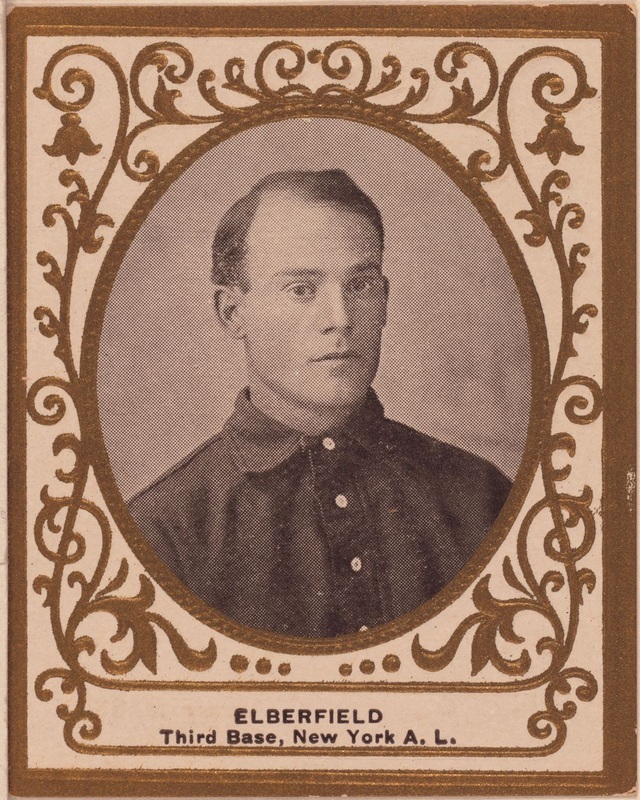 Elberfeld played in Washington until 1911. 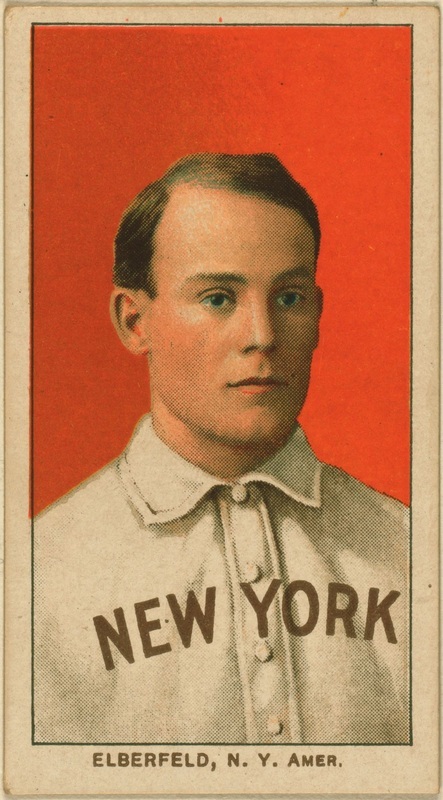 In 1914 at the age of 39, Kid spent one final season in the majors with Brooklyn. The Elberfled-Cobb battle was one of the most notable rivalries of early 20th century baseball. Elberfeld would stop Ty Cobb's headfirst slides into second base. According to an interview conducted shortly before his death in a 1944 edition of the Washington Post, Kid was quoted as saying "Ty found out my feet were harder than his head. Then he started coming in spikes first. I had to protect myself." According to Clark Griffith, the Kid's idea of protecting himself was swinging first. "He couldn't lick Cobb, he weighed only 150 pounds, but he never stopped trying." "When Cobb came into the bag and Elberfeld was covering, we'd just stand around with our arms folded for the next few minutes and watch the goings-on, until one or both of 'em were thrown out of the game." Griffith said, "They didn't call him Tabasco Kid because he was shy." It is rumored that Kid would pour whiskey into his spike wounds on his legs, and carried many scars left from high flying spikes. Starting in 1915, Kid managed the Southern Association Chattanooga team, then an Arkansas team and eventually ran a baseball camp in Atlanta before retiring to his apple orchard near Chattanooga. Kid fielded his own family team with five girls and one boy. His five girls formed a basketball team known as the Elberfeld Girls touring the South. The Tabasco Kid died in 1944. He was laid to rest with his wife, son and two daughters in Chattanooga. His head stone simply says: "Norman "Kid" Elberfeld 1875-1944". Kid has the distinction of having 3 different cards in the T206 set, one shy of Cobb's T206 card total. Kid was popular enough for a team change to be made, creating the scarce Washington Portrait variation. Kid's rookie card would be the rare 1903-04 Breisch-Williams E107. My personal favorite card is his 1909 T204 Ramly. The Ramly cards feature a black and white player image set inside an oval frame. The borders and oval frame are embossed gold. The gold flakes away similar to the T205 gold borders and are subject to being touched up with ink or paint. It looks like the kid is looking a little more to the left than in the above picture. The hair is slightly different. This looks like the above picture, but with the NY letters removed and the eyes looking more forward.